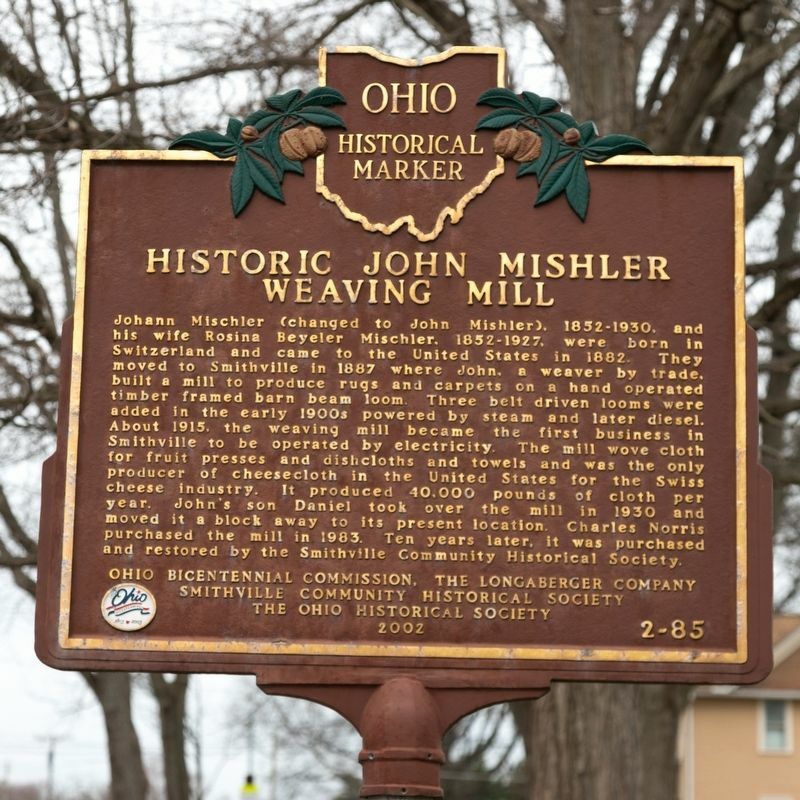 Johann Mischler (changed to John Mishler), 1852-1930, and his wife Rosina Beyeler Mischler, 1852-1927, were born in Switzerland and came to the United States in 1882. 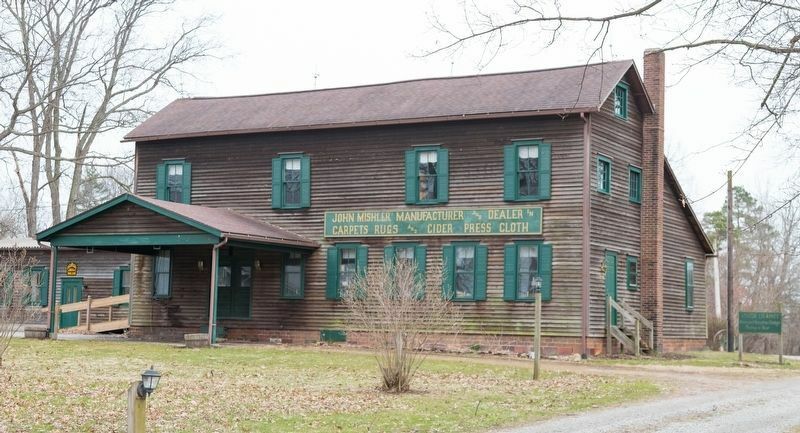 They moved to Smithville in 1887 where John, a weaver by trade, built a mill to produce rugs and carpets on a hand operated timber framed barn bean loom. Three belt-driven looms were added in the early 1900s powered by steam and later diesel. About 1915, the weaving mill became the first business in Smithville to be operated by electricity. The mill wove cloth for fruit Presses and dishcloths and towels and was the only producer of cheesecloth in the United States for the Swiss cheese industry. It produced 40,000 pounds of cloth per year. John’s son Daniel took over the mill in 1930 and moved it a block away to its present location. Charles Norris purchased the mill in 1983. Ten years later, it was purchased and restored by the Smithville Community Historical Society. Location. 40° 51.934′ N, 81° 51.345′ W. Marker is in Smithville, Ohio, in Wayne County. Marker is at the intersection of East Main Street (Ohio Route 585) and East Prospect Street, on the right when traveling east on East Main Street. Touch for map. It is at the mill. Marker is at or near this postal address: 383 E Main St, Smithville OH 44677, United States of America. Touch for directions. Other nearby markers. At least 8 other markers are within 10 miles of this marker, measured as the crow flies. General Reasin Beall Homestead / Wayne County Historical Society (approx. 5.8 miles away); Harvey Howard House / Central Christian Church (Disciples of Christ) (approx. 6.3 miles away); Wayne County Soldier’s Monument (approx. 6.4 miles away); Twenty Pounder Parrott Guns (approx. 6.4 miles away); Barnhart Rice Homestead / Frederick Rice (approx. 6.7 miles away); To the Heroes (approx. 6.8 miles away); Ohio Agricultural Experiment Station (approx. 6.9 miles away); Sonnenberg Settlement 1819 (approx. 9.7 miles away). More. 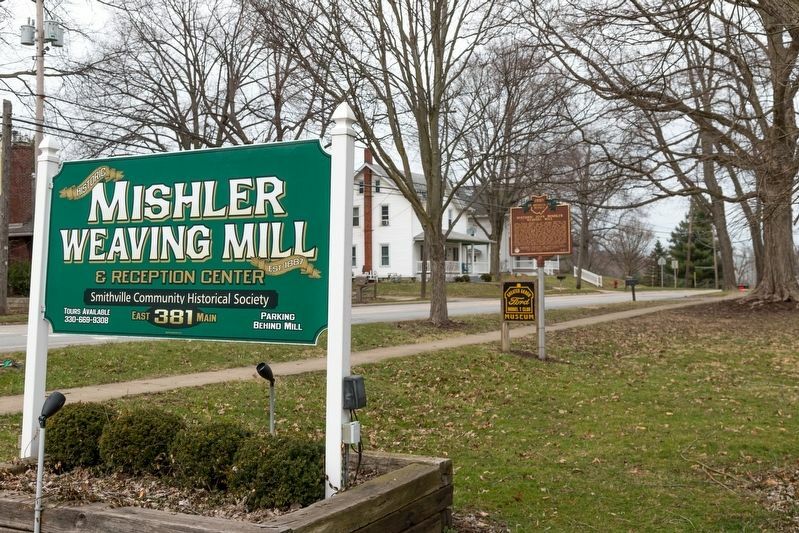 Search the internet for Historic John Mishler Weaving Mill. Credits. This page was last revised on April 13, 2019. This page originally submitted on April 13, 2019, by J. J. Prats of Powell, Ohio. This page has been viewed 47 times since then. Photos: 1, 2, 3. submitted on April 13, 2019, by J. J. Prats of Powell, Ohio.